We all know nothing is more precious than our children and that working with these cherished beings is a truly rewarding experience. A qualification in early childhood is suitable for people who have a special affinity with young children and it appeals to those who really enjoy making a positive and momentous impact upon children’s lives. The training is very practical, you can look forward to acquiring the hands-on skills needed for a rewarding career as a early childhood professional, nanny or perhaps you are keen to start your own family day care business. All of these could be possible with a Kath Dickson Institute of Early Childhood Studies childcare qualification. The Kath Dickson Institute of Early Childhood Studies has offices in Toowoomba and the Sunshine Coast. These offices are complemented by full time administrative staff and large well-equipped training rooms. Our training rooms contain modern teaching aids in order to offer evening classes and an array of professional development sessions. The Kath Dickson Family Centre’s Resource Library is housed within the Kath Dickson Institute of Early Childhood Studies at 2 Lawrence Street, Toowoomba. All Kath Dickson staff and students have access to this large and comprehensive range of training resources designed to meet the requirements of the courses on offer at the centre. Books, videos, journals and current publications are all available at the Library. Resources are also offered to trainees in the field as a complement to their studies and to share with other Educators in service. The Kath Dickson Institute of Early Childhood Studies offers Certificate and Diploma level qualifications that are delivered by qualified training staff. There are nine early childhood trainers delivering courses across and visiting trainees and apprentices throughout Queensland. At Kath Dickson Institute we value that not one study approach fits all. That’s why we offer you the flexibility to learn how it suits YOU best – classroom, onsite, external. Our trainers visit all services once a month to offer theoretical and practical training and assessment to our students tailoring our services to meet the needs of individual workplaces. Enjoy regular communication with your personal trainer by phone and/or email and know that your trainer will make personal visits to you at your place of work to train and assess your practical skills. External studying gives you the benefit and comfort of working from your own home or office at a time convenient to you. Just email your assessments to your assigned trainer. To find out more about Kath Dickson Institute call us today or visit our website for more information to see if you may qualify for a government incentive or funding assistance. 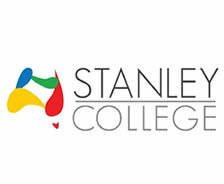 Stanley College is a modern and innovative tertiary institution offering careers and university study pathways for domestic and international students. It provides a favorable learning environment that allows creativity and opportunities for students to achieve academic success and personal growth.